"... and hell followed with him.". A small gold mining camp is terrorised by a ruthless land owner wanting to take their land. Clint Eastwood arrives riding a pale horse just as a young girl is praying to God to help the miners. 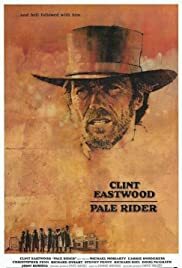 He is revealed to be a preacher with mysterious and possible otherworldly origins who teams up with the miners to defeat the land owner and the corrupt sheriff.